The following radio is no longer recommended. Since the original review and the update at its end there have continued to be more reports of defective units. 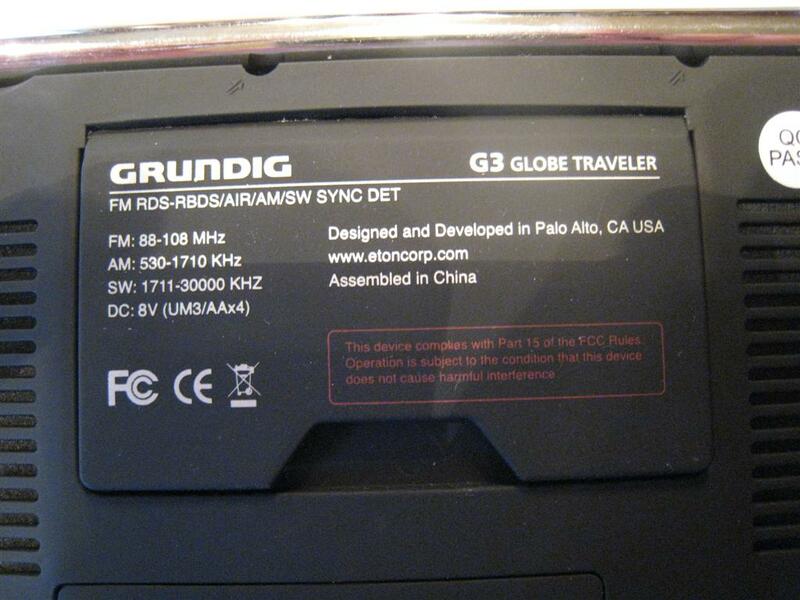 I have now personally seem about two dozen G3’s and of those only 2 have seemed to operate normally in all respects. 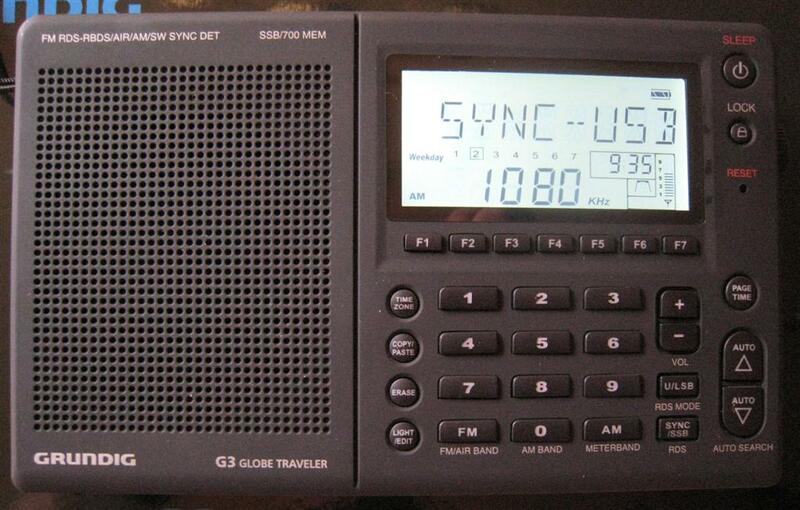 The G3 may be the most problem-plagued radio in recent memory…a shame since a properly working G3 is a nice radio. Even now it is being closed out at Radio Shack and there are reports of defective units. I’m leaving my original review as it was but bear in mind that the continued defect rate makes it a risky purchase. I’ve got to tell you right up front that I put my name on a waiting list to get a G3 the moment they were available. Why? Well for one thing, I own its predecessor – the Grundig G5, which I have long considered to offer the very best performance available anywhere near this size and price range. The G5 (and identical Eton E5) were based on the popular (and still available) Degen DE-1103/Kaito KA-1103, and were essentially the same radio with a redesigned user interface to include Up/Down volume buttons – a feature notably absent on the original 1103. But the performance was the thing. Whether you have an 1103, an E5 or a G5, you have in your hands a radio with phenomenal RF capability in this size and price class. 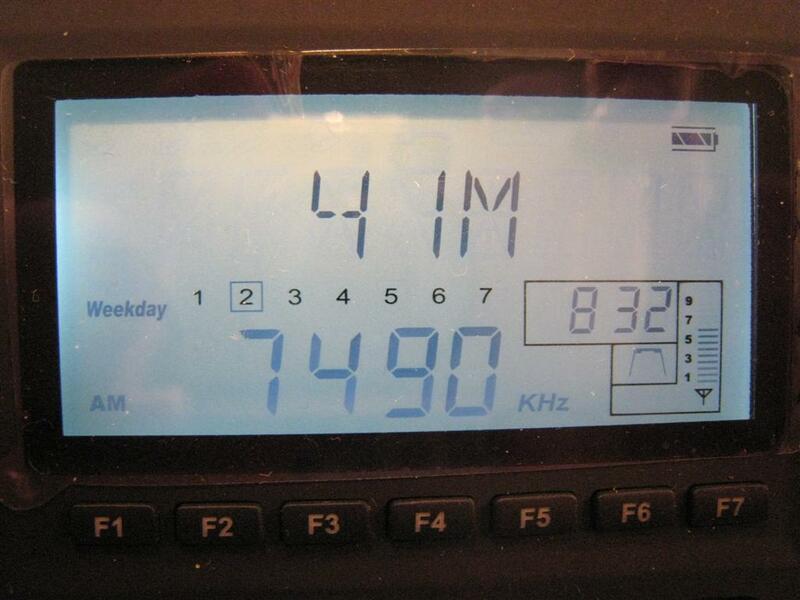 On all bands (AM/SW/FM), these radios pull in signals like a magnet. They feature amazing sensitivity, a low noise floor, and great selectivity – there is just no other radio this size or price that will “hear” as many listenable signals, and in the world of smaller portable radios, that’s a primary concern. They also sound very pleasant for their size and make great travel companions. So How Could These Little Wonders Be Improved Upon? Ah…good question! Eton has come up with several ways to make a good radio even better. One of the most important improvements is the addition of Synchronous Detection, usually referred to simply as “sync”. Synchronous detection allows the radio to lock onto or sync with an AM or SW station’s carrier signal, then discard that carrier and replace it with a perfectly clean and stable signal generated within the radio. This offers several advantages over traditional envelope detection. It can sometimes greatly reduce the annoying fading and distortion caused by so-called “selective fading,” which often plagues AM and SW signals. During selective fading, portions of the station’s carrier signal are varying in level leaving the audio information, contained in the sidebands, with a poor quality carrier signal to reference to. The result is mild to gross distortion varying over time. The improvement sync can give on such a signal can be dramatic…sometimes switching to sync mode can drastically clean up such a fading signal. Sync can also let you choose to listen to either the upper or lower sideband of a signal ignoring the opposite sideband. This can be a big help if only one of the station’s sidebands is being interfered with, such as when it is adjacent on the dial to a stronger signal which is crowding it. Let’s say you are trying to hear a signal on 6000 kHz but there is interference from another signal on 6005 kHz. In that case you would engage lower sideband sync mode and completely ignore that interfering signal on the upper sideband of your desired signal. Again, sometimes the effect is dramatic. A well designed sync circuit can sometimes make a hopelessly bad signal literally “jump out of the mud” and sound great. Of course, radios vary in terms of how well their sync circuits work…we’ll see in due course how the G3 stacks up in this regard. The G3 now offers switch-selectable upper and lower single sideband modes which makes tuning SSB signals much easier than in the previous models. The G3 adds the 118-137 MHz Air Band. If you live near enough to an airport you can listen in on airplane and tower communications. A real boon to FM enthusiasts, RDS allows you to see text information broadcast by many FM stations. Typically you’ll see the station’s call letters or name, song title and artist. Other information can also be broadcast by some stations. … let’s you use your G3 as an amplified speaker for an IPOD or other audio device in addition to feeding stereo signals out of the G3 for connection to an external audio system or recorder. As is often the case with newly-introduced world band portable radios, some of the initial G3’s had problems…that G3 I had pre-ordered and waited so many months for was a disappointment…so much so that I ended up sending it back. Its synchronous detector would only lock onto very strong signals, rendering it pretty much useless. Worse, the AM band was full of birdies and spurious noises which ruined reception of virtually every signal I tuned in. SW was not bad but not quite as good as my older G5/E5 radios. On top of this I was reading on-line that other people were experiencing similar issues…this clearly was not a case of a single bad unit but rather a design or production problem I hoped Eton would iron out. Luckily, it seems they have. I began reading of better-performing G3’s that did not have any of these issues so I decided to try another. In fact, I decided to try TWO others because my second unit was serial number 29 and I wanted to try one with a higher serial number as well…the later one is # 1308. (My guess is that #29 was updated by Eton). I’m happy to report that these G3’s deliver the kind of performance I was hoping for and that the G3 offers some worthwhile advantages over the earlier models…they were worth the wait! My first goal was to compare the new G3 with my earlier G5 as a standard of comparison. I spent several weeks band scanning on both radios to compare their absolute overall performance, along with lots of listening to each radio to see how the overall experience compared. In terms of reception the G3 runs neck and neck with the earlier models, with each having certain pros and cons. On SW they seemed identical…hard as I tried I could discern no meaningful differences between the old and new models in terms of sensitivity, selectivity and overall reception…which is good news. Swapping the positions of the two radios under test (always an important thing to do when comparing portable radios side by side) often produced bigger differences than any which may have been present in the radios themselves. The dual bandwidths are well chosen with the Wide mode offering good sound and reasonable selectivity for most listening and the Narrow position offering increased selectivity at the expense of some audio crispness or clarity when signals are closely spaced. I checked all the active frequency bands day and night and listened to all manner of strong and weak signals and the two models always seemed identical. However the G3 has a slightly mellower tone quality than the older models so any noise there was seemed a bit less noticeable on the G3. Further the G3’s sync detection provided dramatic improvements on some signals. It not only reduced those annoying fades which AM and SW are known for but it also helped separate interfering signals squashed together on the dial. At other times things were better without sync. This is often the case because sync is not a magic elixir that can fix everything – some signals are made worse by sync. As I always say, that’s why it has an On/Off switch! There are however some limitations to the G3’s sync worth understanding but first we must have a slightly technical discussion of how sync circuits compare. Two major specifications of a radio’s sync circuit are known as sync-lock width and sync-lock depth. Width specifies how far above or below the center-tuned frequency the circuit is capable of locking onto the signal. With other sync-equipped radios I’ve used this is generally in the range of +/- 3 or 4 KHz. In other words, a signal on 5000 KHz should lock into sync mode when you are tuned anywhere between approximately 4997 to 5003 KHz. The G3 however only locks on when precisely tuned to 5000 KHz. That alone is not terrible for this class of equipment but it does mean that with typical manufacturing tolerances some units will likely be off by a digit or so. Indeed my older G3 will only sync onto that signal when tuned 1 KHz low…or 4999 KHz…this is consistent across all AM and SW frequencies on that radio. Another sample I checked at a nearby store did the same thing. With temperature differences, battery voltage or general aging it is reasonable to assume this may change over time as well. I hope Eton can slightly widen the sync lock width in future production. It may not affect actual reception as much as it is an annoyance. As for sync lock depth, that has been improved as I mentioned earlier. The latest G3’s will lock onto reasonably weak signals but again, this could be even better. If you are listening to a signal that falls below about ¼ on the signal strength meter the sync loses lock…as it comes back into lock there is usually a momentary mute which can be annoying – perhaps this can be improved a bit as well. Still…since the sync on the G3 often helps dramatically it’s great to have the option. In AM mode the G3 was similar to but just slightly less sensitive than the older models and seemed to exhibit slightly less aggressive AGC (automatic gain control) action as well, so some very weak signals were received at a slightly lower volume than stronger ones. For perspective this was not noticeable on the majority of signals I compared, but only with some very weak daytime signals, especially near the upper end of the AM band. At night, when most signals are stronger I found it difficult to detect this difference at all. Again the sync circuit sometimes cleaned up fading or interference-ridden signals very nicely and was a tremendous advantage. Note: Some AM stations now are broadcasting in HD (High Definition) using Ibiquity’s IBOC (In Band On Channel) digital system. (You can do an internet search for Ibiquity if you want to learn more about it). Such stations do not sound good on most sync-equipped radios but this is not a fault of the radio. AM IBOC causes a rumbling or rushing noise when sync is engaged except on the very few radios that offer a third sync mode, Dual Sideband Sync. The only radio I own which offers this feature is the ($500) Eton E1. Again, if sync makes the signal less good, simply turn it off. Consider it as a tool you can use when it helps. On FM the G3 was slightly less sensitive than the G5 but it was also more selective and better at rejecting false images. In my suburban location with a mix of stronger and weaker signals each radio could receive some difficult signals clearly that were troublesome on the other radio. For the handful of very weak signals that had no strong adjacent stations, the older model pulled those in more easily, but for stations that were crowded together on the dial the G3 was easily the winner. It was interesting that each radio thus received some signals that the other one couldn’t…overall I would a slight edge to the G3, but depending on your location either one might have a slight advantage over the other. Another improvement – the G3’s signal strength meter now functions normally in FM mode, although the owner’s manual incorrectly states that it does not. The G3 offers greatly improved SSB performance. You can now select Upper or Lower Sideband modes at the press of a button which makes tuning SSB much easier. You then perform coarse tuning with the tuning knob, and finally zero in for best audio using the fine tuning thumbwheel. Both wide and narrow filters are available in SSB mode which is a bit unusual as well, and I suspect the less aggressive AGC I noted earlier helps SSB sound a bit cleaner on the G3. I discovered that the G3’s external antenna jack does not function for AM as it did on the older models. Also, the IF Wide/Narrow switch doubled as a tone control for FM on the old model…it does not on the G3. Finally the G3’s buttons are not lit (although the manual incorrectly says they are). On the positive side the Scan function is much more effective on the G3…it scans more slowly than the old model but it finds more listenable signals, making scan far more useful and a joy to use. At night though with many stronger signals available I often set the DX/Local switch to Local while using Auto Scan…in crowded bands it may otherwise stop at virtually every frequency. The G3 is a very full-featured radio. In addition to those we’ve already discussed you also get 4 alarms, sleep timer, internal battery recharging, 700 randomly assignable memories in pages with 8 digit alpha tagging (it was only 4 characters on the G5/E5), and a new Copy/Paste function that lets you copy memories from one location to another. The use of any of these features is optional but you will need the Owner’s Manual to learn how to use them. Unfortunately the manual makes this slightly tougher by not offering the usual diagram of the radio showing the location of all the controls, but any of the features that are important to you can be mastered with a little practice. There are a few errors in the manual although Eton has been known to update their manuals with new models so yours may vary. For one, there is no diagram showing the dual functions of the 7 multi-function F keys under the flip stand as stated (and as provided on the older models). I have provided it here for you…the functions are the same as the previous model. One that needs explanation is the Scan Set button which lets you choose from three auto scanning modes; Scan & Stop (the default mode), Scan, Delay, Continue, or ATS (automatic storage of the frequencies found). I have always been a portable radio junkie and in my book Eton has hit another home run with the Globe Traveler G3. It offers many new features and represents the new state-of-the art in performance for smaller portable world band radios. It is also intriguing that all these extra functions have been carefully fit into the identical cabinet as the older model…even the buttons and switches appear identical although many have different functions on the new model. 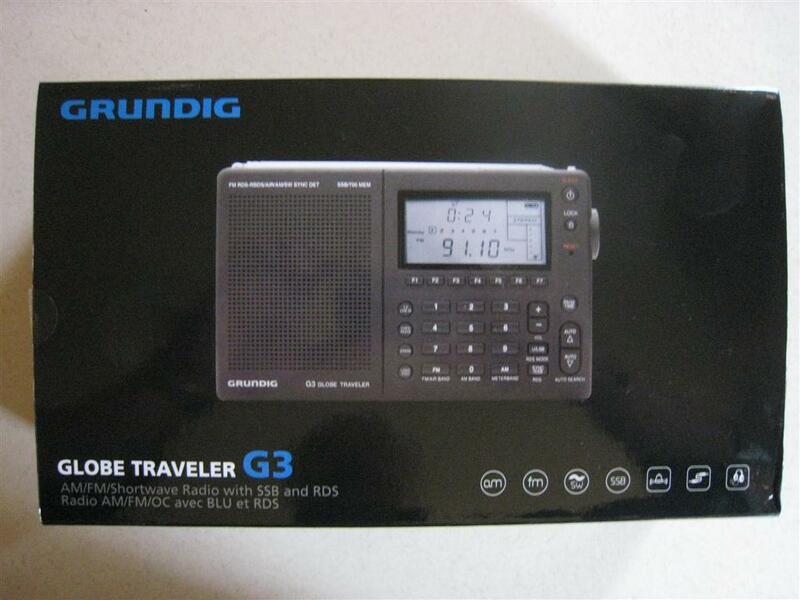 Wherever your travels may take you, be it overseas or just from room to room, the Grundig G3 will bring in signals as well as or better than any comparable radio, all in a neat attractive package that’s fun to use. As such it is a worthy new addition to Eton’s line-up. I highly recommend it!